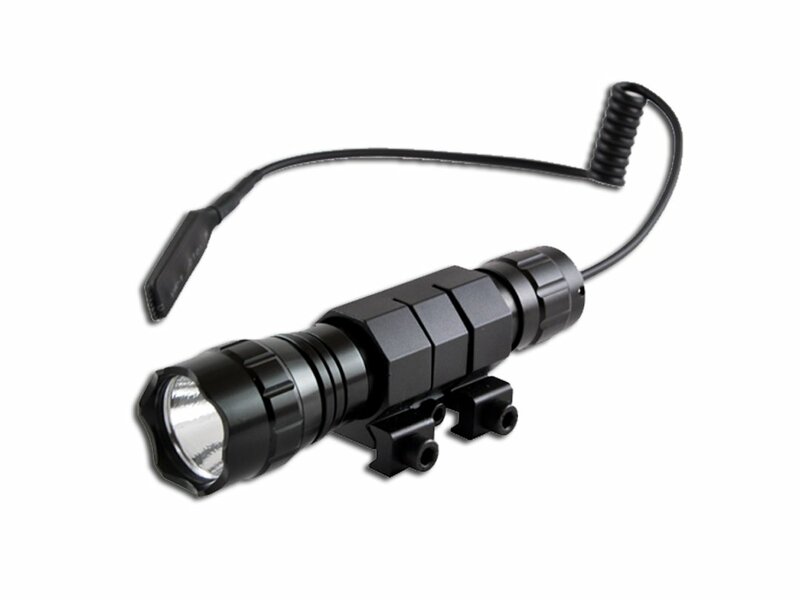 One of the favored accessories for avid weapon fans these days is the UTG tactical flashlight. Not only because they are bright and handy, they also make an tool for self-defense, especially when used properly. One advantage of using a UTG flashlight is that they are legally approved in the US states and other parts of the world. This means even if you are in a plane or any public transport where handguns are prohibited, you can freely carry a flashlight without restrictions. Another thing is that, they do not cause any issues even if you drop them in public places. Imagine dropping a knife or handgun instead – you should anticipate panic or commotion from those who sees you’re carrying one. Flashlights are also handy when you want to illuminate a threat area. Not only for humans, they can easily disorient animals if you want to shoo them with ease. What’s more, you can pair it with your preferred type of weapon to enjoy a great tactical benefit. For attackers, a dark shadow and a wall of light will be the only thing they will see. Here, you will conceal not only your position, but also your other weapons such as handguns, knives, or batons. Hence, there is a higher chance to survive. The Xenon Light eliminates searching and assessing dim environments through its high 126 lumen output. 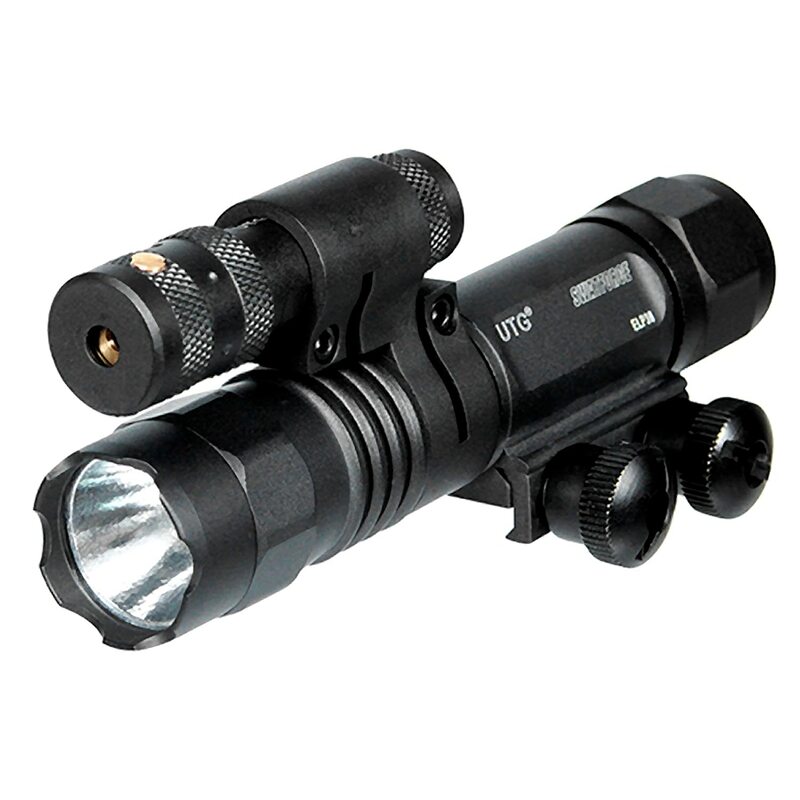 This flashlight can be used by itself, slid into a flashlight ring, or mounted on a weapon’s Picatinny rail. The impeccable performance of the Xenon Light lies inside the bulb, which is skillfully integrated with a circuit board and optimized reflector. Another feature of this flashlight is its multiple activation system, which allows you to let the light on continuously or momentarily by a simple twist or push of the end cap. Xenon uses two CR123A batteries and designed with fairly well-made aluminum body. 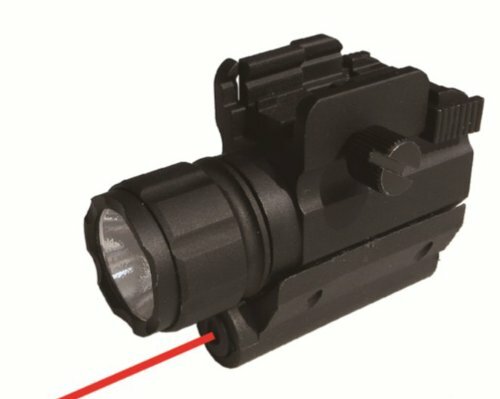 Yet another entry from Leaper’s, Inc. is the UTG LED Weapon Light with Red Laser. In terms of power source, material used, and light activation methods, it’s almost identical with the Xenon Light. The only difference is, that it comes with a Class 3R Laser and a rotational offset ring, which can be rotated at 16 different positions. That way, you can mount the laser in any way you want for a more precise aiming. A flashlight for the environments, this is basically what the Orion LED Tactical Flashlight is designed for. The body itself is compact and does not shrink even when exposed to extreme temperatures, thanks to its LED emitter that’s included in its little package. The output is 500 lumens, which is considered ultra-bright compared to its leading rivals that only have a 100-lumen output in average. At the middle of the product are two switches, one for constant lighting and the other for momentary illumination. Flashlight’s material is aircraft grade aluminum and also powered by 2 CR123A batteries. 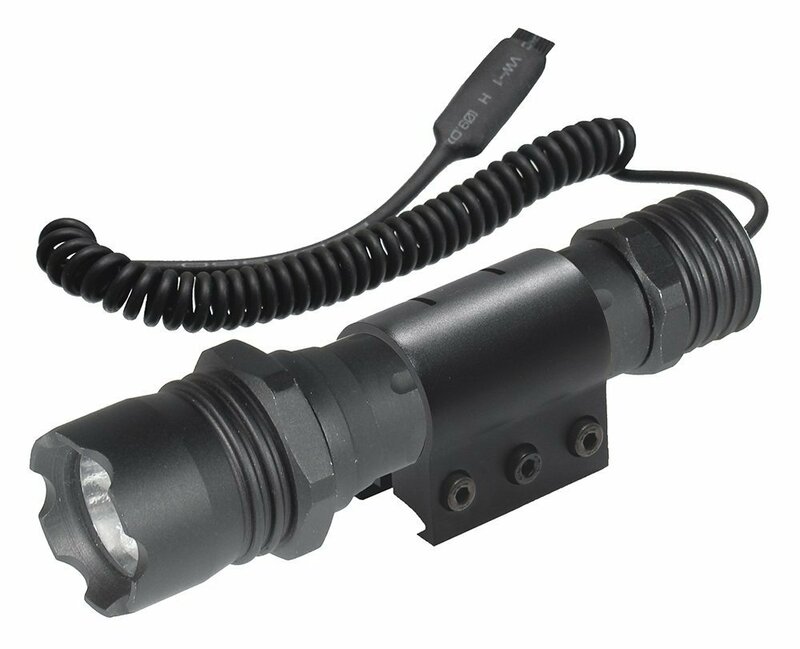 This tactical flashlight features a unique combination of a 200-lumen LED light and a 5mW green laser light. Lightweight and robust, this flashlight boasts aircraft-grade aluminum body, which is integrated with solid stainless steel. This flashlight is also designed to mount and switch on or off. 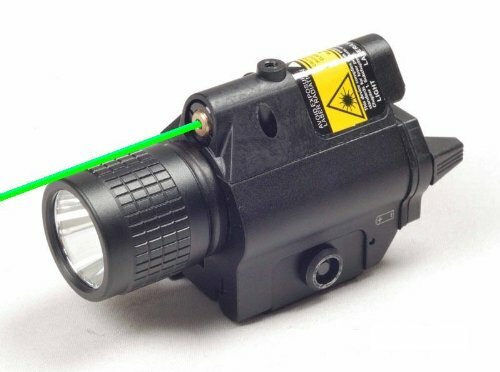 The green laser helps you do more accurate targeting, which you can easily achieve through its adjustable windage and elevation. The battery powers the flashlight for up to two and a half hours. HiLight allows you to have a grasp of the perfect defense gear through its powerful red laser and flashlight combo. The 400-lumen P5C flashlight fits most rails of compact and sub-compact pistols. To power up, it uses a CR2 lithium battery. To help you experience a self-defense, it is designed with strobe mode, along with a red laser for easy and accurate targeting. Alternatively, you can set it to always on mode so it illuminates your way effortlessly. The above options are your best bet if you’re in the market for robust, durable, powerful, and feature-packed flashlights. Make sure you have one in possession, especially if you’re always running outdoors or simply want to be always ready for calamities or emergencies. Consider getting one that’s convenient to carry, ultra-bright, made of quality LED bulbs, housed in a rugged body, waterproof, and of course, made by a well-established company. You don’t want to invest your money on a tactical flashlight that will last you only a few uses. You want one that stays in perfect working condition so you’ll have a right light when you need it.